What makes a good literature display? Our countertop catalog and brochure racks feature leaflets with high visibility designs and come with a suite of options. It's easy to present marketing and promotional materials in service organizations, retail stores, restaurants, and information centers. Styles include a wide variety of single-pocket and multi-tier designs in clear acrylic, wood, wire, or cardboard construction. 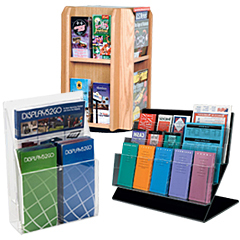 Countertop catalog and brochure racks come in a full range of shapes and sizes to accommodate tri-fold pamphlets, flyers, and magazines. Browse desktop literature stands with adjustable pocket widths, portable constructions, and custom print options for high detail branding. 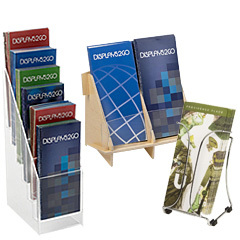 Our countertop catalog and brochure racks excel make ideal sales and marketing displays both in the office and at commercial events. What types of tabletop literature organizers do we offer? Countertop catalog and brochure racks are available in single and multi-pocket fabrications. Tiered literature displays offer maximum visibility for multiple booklets in the smallest amount of space. 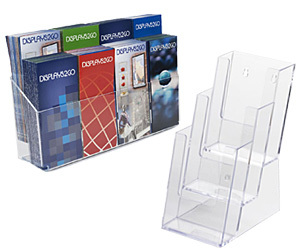 These desktop fixtures keep offices organized while offering customers a range of product sheets, pamphlets, and magazines. Single pocket catalog and brochure racks are great for putting the focus on one stack of leaflets like menus, maps, and forms. 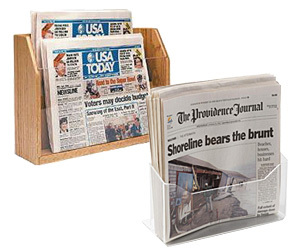 Periodical displays for counters hold newspapers, magazines, and sales circulars. Many designs feature an open wire design that makes them a great choice for reception or waiting areas. 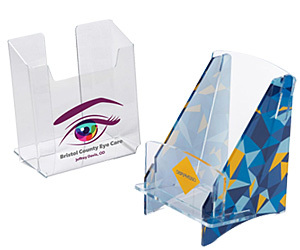 This type of tabloid holder keeps reading material as well as promotional or sales pieces at customer eye level where it will have the most impact. 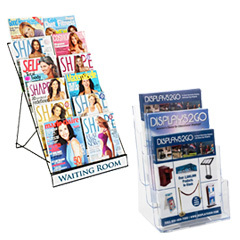 Portable magazine and brochure racks are ideal for trade shows, promotional events, and other off-site events. Their lightweight construction and snap-together designs make them easy to store, carry, and set up in different environments. 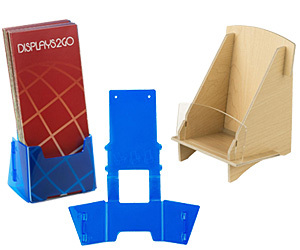 These simple cardboard and acrylic flyer holders are for sale with a number of affordable customization options that makes them easy to brand with logos or messaging for trade shows or special offers. Rotating flyer displays allow commercial businesses to present a large variety of flyers and tri-fold pamphlets in a minimal amount of counter space. 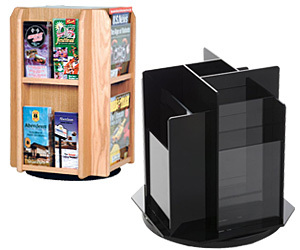 These spinning literature dispensers are great for use in retail environments as well as in schools and community organizations. Combination displays feature advertising signage as well as pockets for marketing collateral. This style is ideal for coordinated campaigns with clear branding designed to attract customers to promotional materials. Easy sign changes make this type of combo promotional display a great choice for office lobbies, retail stores, religious organizations, and schools. What materials are used to make tabletop magazine and pamphlet holders? 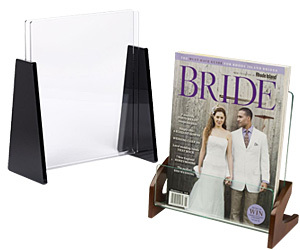 Clear acrylic magazine and brochure racks ensure visibility for printed flyers, catalogs, and other printed collateral. This see-through plastic construction is available with custom printing, featuring logos and messaging in full color. Natural wood racks help give an upscale look to reception areas, professional offices, and waiting rooms by organizing marketing or reading material. Simple designs and finishes enhance traditional décor styles. Metal and wire tabletop racks have high durability as well as easy accessibility. 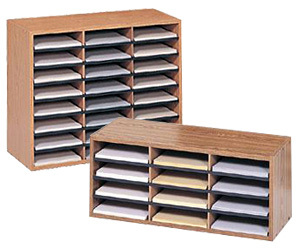 Multi-pocket models with rotating bases that are ideal for maximizing space in shared offices or retail environments. 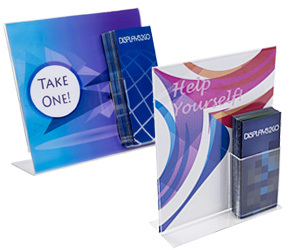 Affordable cardboard pamphlet holders are the perfect choice for off-site marketing campaigns — they're economical and easy to store, move, or set up. 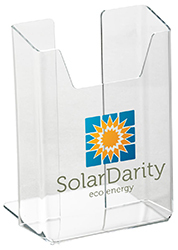 These portable holders and displays come in a full range of sizes, and are easily customized with logos and branding information. Take-away collateral is a cost effective promotional choice for any business. Information about pricing, services, and menus can have a huge impact on sales. High-end printed materials such as annual reports, service and policy booklets, white papers, press kits, and presentation folders are great for boosting marketing campaigns. Magazine and pamphlet displays make great budget friendly trade show tools because visitors leave with something that will remind them long after the event has ended. Printed promotional materials, however, are useless until they reach the intended audience. Our high visibility sales and marketing displays are designed to attract customers and make it easy for them to get the information that companies want them to have.